Conducting Research – Skill gaps, Standards, Benchmarks, Productivity and Technology , Delivery Mechanism – Curriculum development, faculty training, delivery methods, training of new and existing manpower . Quality Assurance – Certification of teachers and students, Course standardization, accreditation of courses and delivery partners. I am Diploma in Automobile engineer from Govt. Polytechnic Ahemdabad (Gujarat) with 15 years of experience in Maruti-suzuki dealership workshop. now I am working as a freelance trainer in same field to increase productivity, profitability and quality of product & service. what should I do to join you in terms of professional. my total working experience 12year in automobile company paint shop coating. Good knowledge in automobile coating technology, & personally total paint coating related all work. Last 2 year experience paint coating production line supervisor in automobile company paint coating service provide unit. 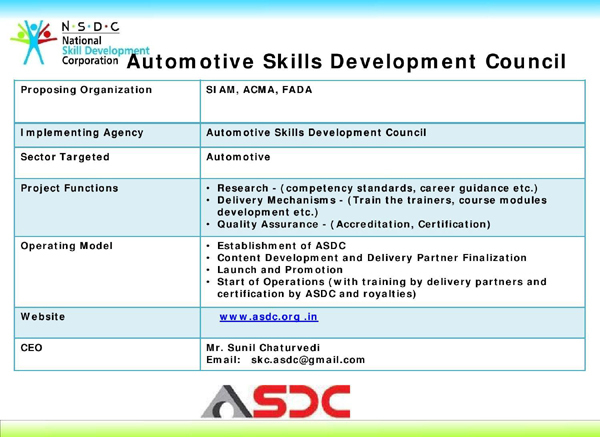 So please sir i am interested join automotive skill development team in gujarat.